(by Julia Manchester, TheHill) – Defense Secretary James Mattis on Sunday issued a stark warning to North Korea, saying the country would be met with a “massive military response” if it threatened the U.S. or its allies. 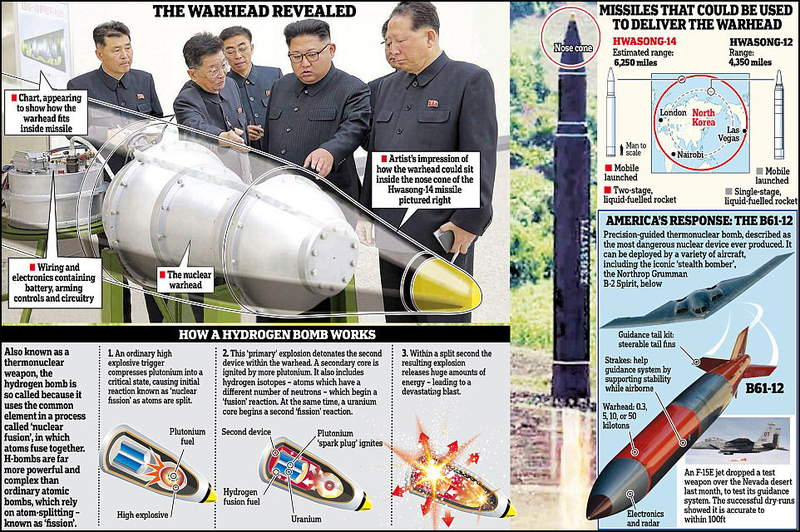 On Sunday: tested a miniaturized hydrogen bomb capable of fitting on an intercontinental ballistic missile (ICBM). Last week: launched an intermediate-range ballistic missile that flew over Japan and landed in the Pacific. “Any threat to the United States or its territories including Guam or our allies will be met with a massive military response,” Mattis said in a statement outside of the White House after meeting with President Trump [and top military commanders]. “Kim Jong Un should take heed of the United Nations Security Council’s unified voice. All members unanimously agreed on the threat North Korea poses. And they remain unanimous in their commitment to the denuclearization of the Korean peninsula. Because we are not looking to the total annihilation of a country, namely, North Korea,” he continued. Mattis said the U.S. had “many military options” regarding the Korean peninsula, and that the president wanted to be briefed on all of them. North Korea’s move is a show of defiance against Washington and the international community. “President Trump reaffirmed the commitment of the United States to defending our homeland, territories, and allies using the full range of diplomatic, conventional, and nuclear capabilities at our disposal,” the White House said. The UN Security Council unanimously voted last month to impose sanctions on Pyongyang after the country launched a series of ICBMs [Intercontinental Ballistic Missiles]. The Defense secretary’s statement matches President Trump’s recent hawkish statements regarding North Korea. Trump strongly condemned Pyongyang’s actions, saying the U.S. was considering imposing sanctions on [any country doing business with North Korea]. First published at thehill on September 3rd. Reprinted here for educational purposes only. May not be reproduced on other websites without permission from The Hill. Visit the website at thehill .com. Security Council members must always be present at UN headquarters in New York so that the Security Council can meet at any time. The Department of Defense (the Pentagon) is the Executive Department of the U.S. government charged with coordinating and supervising all agencies and functions of the government concerned directly with national security and the U.S. armed forces. The Department – headed by the Secretary of Defense – has three subordinate military departments: the U.S. Department of the Army, the U.S. Department of the Navy, and the U.S. Department of the Air Force which oversee the U.S. Army,U.S. Navy, U.S. Marine Corps, and the U.S. Air Force. In addition, four national intelligence services are subordinate to DOD – the Defense Intelligence Agency (DIA), the National Security Agency (NSA), the National Geospatial-Intelligence Agency (NGA), and the National Reconnaissance Office (NRO). The Secretary of Defense (currently James Mattis) is in the chain of command and exercises command and control, subject only to the orders of the President, over all Department of Defense forces (the Army, Navy, Air Force, and Marine Corps) for both operational and administrative purposes. The Chairman of the Joint Chiefs of Staff is the principal military adviser to the Secretary of Defense and the President, and while the Chairman may assist the Secretary and President in their command functions, the Chairman is not in the chain of command. The Secretary of Defense, Secretary of State, the Attorney General and the Secretary of the Treasury, are generally regarded as the four most important cabinet officials because of the importance of their departments.